From the chiseled peaks of the Andes Mountains and the sweeping valleys below; the Incan ruins of Machu Picchu where ancient civilisation lives on today; to vibrant cityscapes with bustling marketplaces and beyond - there’s so much to love and learn about Peru, past and present. Experience the very best of Peru on this 12 day package visiting Lima, Cusco, Aguas Calientes, Machu Picchu, the Sacred Valley and beyond. Get a taste of the Peruvian way of life on a tour of vibrant Lima; wander through the historic streets of imperial Cusco; witness the spectacular Andes Mountains; tick off the bucket list with a visit to the grand citadel of Machu Picchu, as well as the Incan ruins in Ollantaytambo; and visit an artisan market in Pisac. 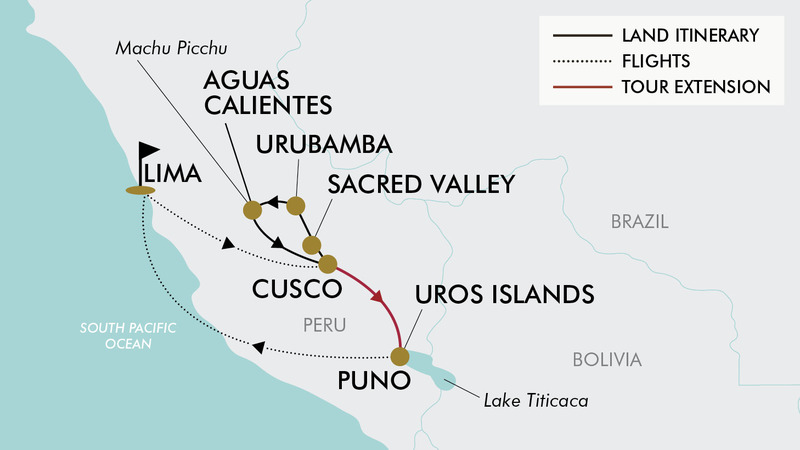 This incredible bucket list tour includes return international flights, additional internal flight from Lima to Cusco, nine nights quality hotel accommodation, daily breakfast, and more. Delve a little deeper on the 16 Day Package including a boat ride across Lake Titicaca, a traditional homestay on Luquina Island and a visit to the Uros floating islands. Today depart from either Sydney, Melbourne, *Brisbane, *Adelaide or *Perth to Lima, Peru via Santiago, Chile. Fly with LATAM Airlines, Qantas Airways or Air New Zealand (subject to availability). Upon arrival into Lima, a representative will be waiting to transfer you to the hotel in Miraflores. Please note: due to flight scheduling and availability, some departures may occur on day 0. Affected customers must be at the airport the day before. Flight times will be indicated on your final documentation which you will receive prior to departure. Today is free at leisure to explore the beautiful city of Lima or alternatively you can take part in an optional tour to the nearby Palomino Islands (not included). This morning you will be picked up from the hotel to begin your half day city tour. First you will visit the exquisite "Koricancha" Temple. Continue onto the Main Cathedral (entry not included), a marvel of religious art home to approximately 300 paintings from the Cusqueña School. Afterwards, travel to the archaeological complex of Saqsayhuamán. You will see the labyrinth of Q’enqo, which is a religious centre dedicated to the adoration of the Earth, and Puca Pucara (reddish place) - previously used as a military control centre. Complete the tour at Tambomachay (Temple of the Water), an Inca site which consists of a series of aqueducts, canals and waterfalls that run through the terraced rocks (entry not included). Afterwards you will be transferred back to the hotel for an evening at leisure. Tonight head to the Tunupa restaurant, located just the central Plaza de Armas of Cusco (short walk from hotel), and get ready for a fabulous buffet dinner. There is a large selection of typical dishes, meat, fish, vegetables. The night becomes more enjoyable when the traditional dance show begins and you can get involved with folk, traditional and classical music, and sweeten your ears with the sounds of Andean instruments: Quena, charango, flute, zampoña. If you wish, you can also share the dance floor with the dancers and enjoy a great experience. Today transfer to the Cusco Airport for your return flight back to Australia via Lima, Peru and Santiago, Chile. After an early breakfast, a local guide will pick you up from the hotel to begin the short bus ride to the gates of Machu Picchu where you may have the opportunity (weather permitting) to enjoy one of the most spectacular sunrises of your life! After entering the Citadel you will begin a guided walking tour (approx. 2 hours), learning about the history of the area and the ruins. Enjoy some free time afterwards to explore this mysterious ancient city at leisure. This afternoon, meet your guide in Aguas Calientes for lunch (not included). Be transferred to the train station and begin the journey back to Cusco via Ollantaytambo. (approx. 3.5 hour train journey). This morning rise early for breakfast and transfer to the bus station to travel to Puno. This is a great bus trip on a modern vehicle stopping at several interesting sites along the way such as Raqchi (Wiracocha God Temple), an Incan church of monumental dimensions and La Raya: the half-way point between Cusco and Puno and also the highest point (4335m above sea level). Along the way enjoy a rest stop and delicious buffet lunch in the town of Sicuani. The landscapes along this route are stunning and typical Andean animals like the llama, alpaca and vicuña are common sights. Upon arrival at the bus station in Puno, you will be met and transferred to the hotel where you will meet your guide who will welcome you and provide you with some extra information for the following days activities. Please note: the bus transportation includes wifi, food and drink services on board, entertainment options, guided narration in English and Spanish, leather seats with wide leg rests, individual tables and air conditioning. Buses do not have toilets onboard, but this journey includes stops approximately every hour to allow for this. After breakfast this morning, transfer from the hotel to the port of Puno where you will board a motorboat to visit the unique floating Uros Islands, located approx. 25 minutes from the port of Puno. The islands have been created entirely from the buoyant totora reeds that grow abundantly in the shallows of the lake. Partially edible (tasting like non-sweet sugarcane), the reeds are used to build homes, boats and handicrafts. The islands are constructed from many layers of the totora, which are constantly replenished from the top as they rot from the bottom, so the ground is always soft and springy. You will visit two different islands and your guide will explain a little about the history and lifestyle of the people who have lived here for many years. You will have the opportunity to visit some of their homes to learn a little about their lifestyle. Enjoy a trip to Taquile Island (approx. 2 hours). A traditional Quechua speaking community, the island is full of ancient agricultural terraces and some ruins dating to pre-Inca times. Community and family are of great importance to the local population, who were relatively isolated from the mainland up until the 1950s. When you reach the island, take the opportunity to enjoy impressive views of Lake Titicaca. Enjoy some free time to explore the island on your own and then come together for lunch at a local restaurant. Following lunch, head down to the harbour to take a one-hour boat ride to the Chicuito Peninsula, south of the city of Puno, where the Luquina Karina community is located. Luquina Karina has remained relatively untouched and tourism is a new concept here. The inhabitants are very willing to receive visitors in their community. You will be warmly received by the families who will take you to their homes to spend the night and cook you a delicious dinner from locally sourced food. Today enjoy breakfast with your host family and then participate in some local activities. After lunch, say goodbye to the local family and head down to the harbour for your boat transfer back to Puno arriving in the early evening. After breakfast, transfer to Juliaca Airport (approx. 1 hour) for your flight to Lima (approx. 1 hour) where you will be met on arrival and transferred to the hotel. The rest of the evening is free at leisure. After breakfast, enjoy some leisure time before transferring to the airport for your return flight back to Australia. Please note: if your flight departs early, breakfast will be arranged for pick up from the hotel reception the night before. Travel offer is valid for travel on selected dates until the 9th June 2020. - Entry into Chile also requires the additional payment of a Chilean reciprocity fee at approximately $117 USD (subject to change) per person payable upon entry. - Business Class (International Sectors only): Buy now for $5499 per person. - Cusco, Peru (Post Tour – 12 Day package only): $100 per room including breakfast. Minimum group size 4, maximum group size 30 per vehicle. - Visa fees and requirements (A visa for Peru is not required if travelling on an Australian passport). - Entrance to Main Cathedral (Day 5 - Cusco City Tour) - approx. $10 AUD. - Entrance to Temple of the Water (Day 5 - Cusco City Tour) - approx. $8 AUD. As Puno is located at such a high elevation (3830m above sea level), it experiences more extreme weather conditions than would be expected for its tropical latitude. The average annual temperature is about 8.4°C, and the weather never gets overly warm. During the winter months from June to August, night-time temperatures usually drop well below 0°C. At this high altitude, the rays of the sun are very strong. Most of the annual precipitation falls during the southern hemisphere summer, with the winter months being very dry. Please note: Customers choosing the stay behind or stopover package post-tour will require to pay a Chilean Reciprocity Fee of approximately $117 USD (subject to change) per person paid at airport customs in Chile. This fee is paid in US dollars and we recommend customers carry sufficient US dollars in cash to pay this fee as credit card facilities may be unavailable. This does not affect customers who do not choose to take the stopover package.